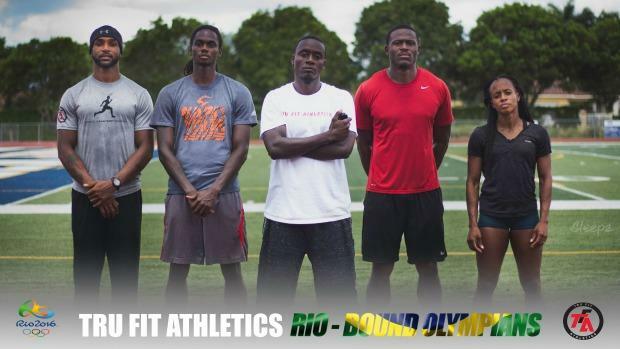 Every morning Coach Joey Scott brings his Tru Fit Athletics group of professionals to the Belen Jesuit track. It's the same place Scott can be found later in the day working with the school's sprinters and hurdlers. He's been a member of the Wolverines program for eight years and working with elites since 2009. Coach Scott says a typical day at the school is long with the pros training from 9 a.m. to 1 p.m. then the Belen sprinters and hurdlers hitting the track at 3:15, but the end result is all worth it. "The pros do 3 hours of the running work out focusing on conditioning and technical things and 1 hour of strength training in the weight room. The workout for my Belen athletes includes conditioning and technical work as well, just a little less intense than the pros. We also do work in the weight room. My day doesn't end till 9 at night most of the time because after the Belen kids I still have clients that I train after them, but it is worth it. I love what I do." Over his time in South Florida at the high school level he has coached seven state champions.This weekend he will be in charge of four Olympians in Rio De Janeiro, Brazil, the most athletes he's ever had to qualify for the Olympics at one time. "We have Tahesia Harrigan-Scott (his wife) who qualified in the 100 meters. This will be her 3rd Olympics representing the British Virgin Islands. Jeff Julmis qualified in the 110 hurdles and this will be his 2nd Olympics representing Haiti. Ronald Forbes qualified for his 3rd Olympics representing the Cayman Islands in the 110 hurdles. Antwon Hicks qualified in the 110 hurdles as well, representing Nigeria for his first birth to the Olympics." Scott calls his group amazing and praises them not just for what they do on the track but how they carry themselves off the track as well. "My group is amazing. Not just what they do on the track but also how they carry themselves off the track. The group is like one big family that push each other to the limits. The cohesiveness is unbreakable." Scott, a former hurdler and sprinter himself at Barton Community College and later the University of Oklahoma, competed on the European circuit and qualified for several U.S. Olympic Trials, but never made the Olympics as an athlete. Instead, he has coached at the last three Games. He says his favorite part is the interaction with different cultures and making new friends from around the world. "I also love the fact that we have all the resources we need right in the village at no cost. Everything is free from getting your teeth clean to massage therapy. The Olympics that stood out to me the most were the London Olympics because we had the opportunity to interact with the fans easier due to the location of the village. The fans tend to bring a lot more energy into the games and in London they were in arms reach." Although they train at different times throughout the day, that doesn't mean they aren't cheering each other on throughout the season. "In my opinion, the main thing both groups have in common, is that the learning never stops. They encounter each other throughout the year and the pros motivate them during the high school season. Sometimes I allow them to train right on the side of them. The pros talk to them all the time and they let them know what it takes to be successful." When Harrigan-Scott, Julmis, Forbes, and Hicks, they won't just have their home countries behind them, but the city of Miami, and those athletes back at Belen Jesuit, who one day hope to follow in their footsteps and compete in a future Olympic Games. "I want to take back the sense of hope that with hard work, persistence, and dedication they can achieve all the goals they set out to accomplish."